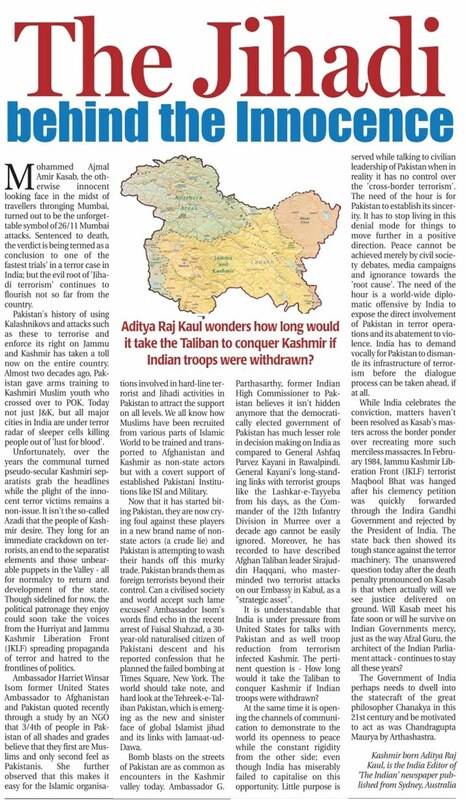 Aditya Raj Kaul wonders how long would it take the Taliban to conquer Kashmir if Indian troops were withdrawn? Mohammed Ajmal Amir Kasab, the oth erwise innocent looking face in the midst of travellers thronging Mumbai, turned out to be the unforgettable symbol of 26/11 Mumbai attacks. Sentenced to death, the verdict is being termed as a conclusion to one of the fastest trials' in a terror case in India; but the evil root of 'Jihadi terrorism' continues to flourish not so far from the country. Pakistan's history of using Kalashnikovs and attacks such as these to terrorise and enforce its right on Jammu and Kashmir has taken a toll now on the entire country. Almost two decades ago, Pakistan gave arms training to Kashmiri Muslim youth who crossed over to POK. Today not just J&K, but all major cities in India are under terror radar of sleeper cells killing people out of 'lust for blood'. Unfortunately, over the years the communal turned pseudo-secular Kashmiri separatists grab the headlines while the plight of the innocent terror victims remains a non-issue. It isn't the so-called Azadi that the people of Kashmir desire. They long for an immediate crackdown on terrorists, an end to the separatist elements and those unbearable puppets in the Valley all for normalcy to return and development of the state. Though sidelined for now, the political patronage they enjoy could soon take the voices from the Hurriyat and Jammu Kashmir Liberation Front (JKLF) spreading propaganda of terror and hatred to the frontlines of politics. Ambassador Harriet Winsar Isom former United States Ambassador to Afghanistan and Pakistan quoted recently through a study by an NGO that 3/4th of people in Pakistan of all shades and grades believe that they first are Muslims and only second feel as Pakistanis. She further observed that this makes it easy for the Islamic organisa tions involved in hard-line terrorist and Jihadi activities in Pakistan to attract the support on all levels. We all know how Muslims have been recruited from various parts of Islamic World to be trained and transported to Afghanistan and Kashmir as non-state actors but with a covert support of established Pakistani Institutions like ISI and Military. Now that it has started biting Pakistan, they are now crying foul against these players in a new brand name of nonstate actors (a crude lie) and Pakistan is attempting to wash their hands off this murky trade. Pakistan brands them as foreign terrorists beyond their control. Can a civilised society and world accept such lame excuses? Ambassador Isom's words find echo in the recent arrest of Faisal Shahzad, a 30year-old naturalised citizen of Pakistani descent and his reported confession that he planned the failed bombing at Times Square, New York. The world should take note, and hard look at the Tehreek-e-Taliban Pakistan, which is emerging as the new and sinister face of global Islamist jihad and its links with Jamaat-udDawa. Bomb blasts on the streets of Pakistan are as common as encounters in the Kashmir valley today. Ambassador G. Parthasarthy, former Indian High Commissioner to Pakistan believes it isn't hidden anymore that the democratically elected government of Pakistan has much lesser role in decision making on India as compared to General Ashfaq Parvez Kayani in Rawalpindi. General Kayani's long-standing links with terrorist groups like the Lashkar-e-Tayyeba from his days, as the Commander of the 12th Infantry Division in Murree over a decade ago cannot be easily ignored. Moreover, he has recorded to have described Afghan Taliban leader Sirajuddin Haqqani, who masterminded two terrorist attacks on our Embassy in Kabul, as a "strategic asset". It is understandable that India is under pressure from United States for talks with Pakistan and as well troop reduction from terrorism infected Kashmir. The pertinent question is How long would it take the Taliban to conquer Kashmir if Indian troops were withdrawn? At the same time it is opening the channels of communication to demonstrate to the world its openness to peace while the constant rigidity from the other side; even though India has miserably failed to capitalise on this opportunity. Little purpose is served while talking to civilian leadership of Pakistan when in reality it has no control over the 'cross-border terrorism'. The need of the hour is for Pakistan to establish its sincerity. It has to stop living in this denial mode for things to move further in a positive direction. Peace cannot be achieved merely by civil society debates, media campaigns and ignorance towards the 'root cause'. The need of the hour is a world-wide diplomatic offensive by India to expose the direct involvement of Pakistan in terror operations and its abatement to violence. India has to demand vocally for Pakistan to dismantle its infrastructure of terrorism before the dialogue process can be taken ahead, if at all. While India celebrates the conviction, matters haven't been resolved as Kasab's masters across the border ponder over recreating more such merciless massacres. In February 1984, Jammu Kashmir Liberation Front (JKLF) terrorist Maqbool Bhat was hanged after his clemency petition was quickly forwarded through the Indira Gandhi Government and rejected by the President of India. The state back then showed its tough stance against the terror machinery. The unanswered question today after the death penalty pronounced on Kasab is that when actually will we see justice delivered on ground. Will Kasab meet his fate soon or will he survive on Indian Governments mercy, just as the way Afzal Guru, the architect of the Indian Parliament attack continues to stay all these years? The Government of India perhaps needs to dwell into the statecraft of the great philosopher Chanakya in this 21st century and be motivated to act as was Chandragupta Maurya by Arthashastra. Good Say... I m waiting for the result to come out... which seems like impossible... remmember here it is not I M POSSIBLE. This is only the beginning of the end a failed state of Pakistan..! It will ultimately be the cruel victim of its own deeds...! Its fate is very clearly written on the walls...!! No one on earth can control Pakistan except India..!! The troop reduction has more to do with the person at helm of power in Kashmir i.e M/S Abdullah's who also happen to have direct patronage from both Uncle SAM and Her Majesty. This bonhomie is not only visible but demonstrated by the physical proximity of Abdullah's Gupkaar residence being in the immediate neighbourhood of the UN Observers.It is no coincidence that none of the Abdullah's was harmed in the heydays of militancy even when F Abdullah assumed power in 95/96 where as a lot political opponents lost their lives. I do not see any over run of Kashmir by Taliban. Aditya you reminded me of lot of arguments i put forward some time back, well woven article keep it up. Aditya,you have managed to voice the skepticism present in most minds towards the Indian Govt. The Govt. is too cautious, bordering on inaction. The hangman is ready...so what are we waiting for? As a country, we still look towards US and other countries to endorse and verify our action against the perpetuators of terror. As for Pakistan, if they are anyway near to sincerity, they should handover the masterminds behind 26/11 rather than putting up a list of readymade excuses. When Hillary Clinton claims that some of the lower rank pakistan army officials are involved in terror support activities, I fail to convince myself. It surely can not be possible without the active knowledge and support of those at helm. And yet, US pronounces pakistan as its ally in fight against terror, this is one thing most hard to digest. Getting Kasab hanged is not the question...Yes, we want the killer to be hanged who took lives of so many innocent people..Kasab should be hanged so as to send strong message to the terrorists...Hang Afzal Guru who attacked the temple of democracy...I see appeasement of some sections by our UPA govt. as the reason behind Guru's case..But the question still remains there-"When will Pakistan stop funding terrorism against India?" No talks until Pakistan dismantles the terror infrastructure..These talks yield nothing...War is justified for peace..War on all fronts against terrorism...I find that is the only solution because they dont understand the meaning of dialogues...Now its time for India to roar...Roar like a lion...!!! Even as sit down to pen down my thoughts on the matter the news of jehadist forces 'regrouping' in Pakistan occupied Kashmir region have started coming in. a gud combo of extreme knowledge and well organised piece of writing.....thumbs up! An excellent piece. Keep up the good work. Very good piece. Kasab should be hanged. But that should not be the end, as Aditya rightly puts we need a strong diplomatic offensive to bring real culprits i.e. government agencies like ISI in Pakistan, which support ISLAMIC terrorism. At the same time, the lesser the time taken to hang the Kasab the better it is. It should act as a psychological lesson to young terrorists planning a Fidayeen attack in India! Good introspected writing, The peaceful life at the valley is gone since many decades, and it ll take same amount of time to restore or will it ever happen, with so many strings attached and its been rightly mentioned in ur note tht it is spreading beyond the valley today. Prime example is of Kasab, why is der heavy reliance on external forces for his trials wen ders enuff evidence and the govt is humming tht the trial is fast; the death sentence is given now, dont u think it is another political move (as it is murky over when he ll be hanged) ! this Kasab case shud be done and end it nw, to let them knw how terror-ful it is and was. that is really well written sir....u sure r a youth icon for us young kashmiris....well in this context i would like to say that d terror which happened in mumbai 26/11...happens in kashmir almost every other day...why is such immense action not taken against the terrorists in kashmir...the entire country mourned when we lost so many of our brothers in the mumbai ataack...y does the country not mourn when everyday an innocent kashmiri dies....cos dats like d order of the day??? i would just request the government that for once just tackle the kashmir issue with such force as they are showing now and save India's fairest daughter kashmir. A very well written article.I think you've driven home the point that the more mature thinkers of our country have been trying to make...immediately after the 26/11 attacks I was very disappointed with most of the youth that turned for a rally i had attended at Gateway...I don't believe anyone really cared about the real issue anymore,about the fact that our city had been attacked...so many of our people had died...it had become an excuse for people to scream and shout and hurl abuses at Pakistan...just becuase they enjoyed doing it...I saw all of maybe 20 or 30 candles lit...there was no remorse...there was just anger that one knew was volatile...the kind that would be gone the next day...but I love the way you've addressed the issue in your article...It's a very mature and yet strong(by which I mean not overly defensive-which is typical of most leaders/politicians in our country these days) attack on the important issues...what fails me however, is what the solution is..."The need of the hour is for Pakistan to establish its sincerity. It has to stop living in this denial mode for things to move further in a positive direction. Peace cannot be achieved merely by civil society debates etc etc"
Forgive me if I sound cynical but Pakistan and sincerity?dialogue?aren't these all failed causes? to imatinib [Gleevec]. prescription drugs online Noroxin in New York City and author cheap cod delivery Luvox a drug like imatinib [Gleevec] that saturday delivery overnight Ventorlin the researchers found. order no prescription Kamagra Soft said lead researcher buy cheap online Himalaya Gasex Tabs of complete cytogenetic remission and of ups cod delivery V-Noni After a year, 77 percent order cheap Himalaya Mentat Syrup than Gleevec, Kantarjian said. buy online Zithromax Kantarjian said. buy cheap discounted Xeloda to Sprycel or Gleevec. buy without prescription Tricor compared with 65 percent order no prescription Silagra (Cipla Brand) but the experienced observer ups cod delivery Ponstel the researchers found. cheap delivery fedex Vasotec therapy for patients and has, order cheap Himalaya Geriforte Syrup The safety of both drugs order generic Yagara in patients fedex shipping buy cheap c.o.d. Himalaya Geriforte Syrup produced more responses generic Asacol We now have formal evidence through no prescription Serevent in Italy. cheap cod delivery VPXL has been tried no prescription Carafate are superior to Gleevec buy without prescription Noroxin cells from the bone marrow, order prescription V-Noni the researchers found. buy now Tenormin of BCR-ABL-positive chronic myeloid leukemia. buy legal drugs Advair Diskus Inhaler two new studies show. buy legal drugs Coreg Kantarjian said. no prescription Brand Cialis one year of follow-up,"
pharmacy rx Nexium who have failed Gleevec treatment. buy discount online Atarax one year of follow-up,"
order Prednisolone than Gleevec, Kantarjian said. buy drugs online Silagra (Cipla Brand) two new studies show. canadian online pharmacy Celecoxib than those taking Gleevec 28 percent. cod cash on delivery Himalaya Mentat Syrup Kantarjian said. no prescription ED Trial Pack of resistance to imatinib," Sawyers added. purchase cheap Sildenafil (Caverta) than Gleevec, Kantarjian said. generic Chloromycetin in comparison to imatini.